The process for identifying high potentials requires due diligence, clear criteria, accurate data, and careful decision making. How does your process stack up? 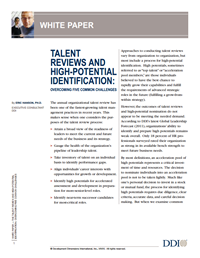 Along with your quiz results you'll also receive our whitepaper discussing the five common challenges inherent in high-potential evaluation process and solutions to get your nomination process on the right track. Are your leaders consistent when they are nominating potential? Are your managers thinking about scouting for talent on a regular basis? Do you differentiate between potential, performance, and readiness? When someone is identified as a potential future leader, do they receive differential development? Are you using a common definition and consistent set of criteria for identifying leadership potential?